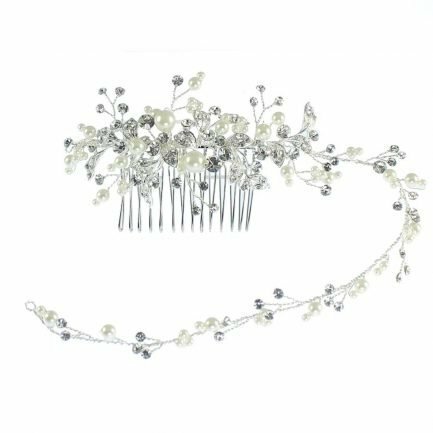 Here you will find our stunning bridal hair comb and clip collections brought to you by well-known British designers like Linzi Jay and Twilight Designs. 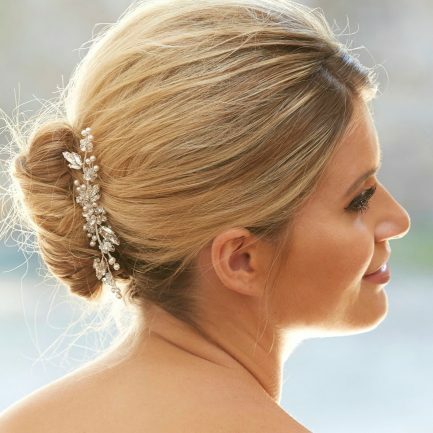 Bridal combs can be positioned just about anywhere in the hair, but they’re better suited for up-dos, or half-up-half-down hair styles so that the comb has some resistance to work against. 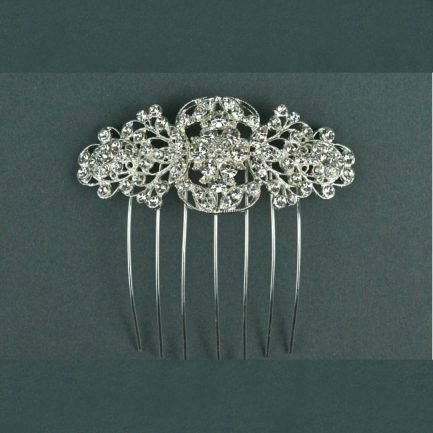 If you are wearing your hair loose, you’d still be able to wear one but the comb would have to be gripped through with Kirby grips to stop it sliding out of your hair. Clips are a little easier to wear, in our experience. The crocodile clip fastenings grab onto even baby-soft hair. 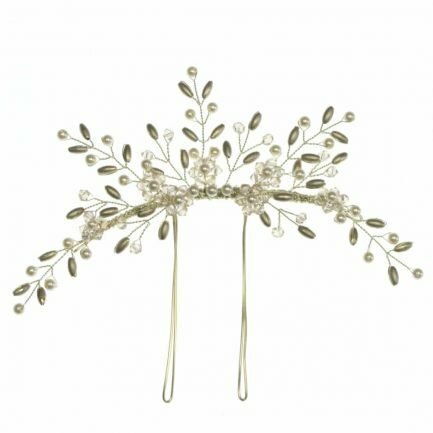 They’re also great for adding a touch of bling to the top of a veil as they fasten to the hair just above the veil’s comb. 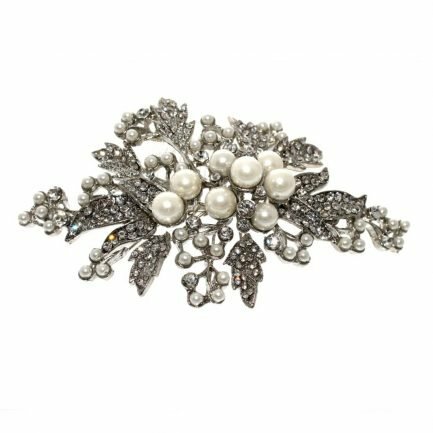 Shown in silver with clear crystals and ivory pearls. Other custom colours available upon request. 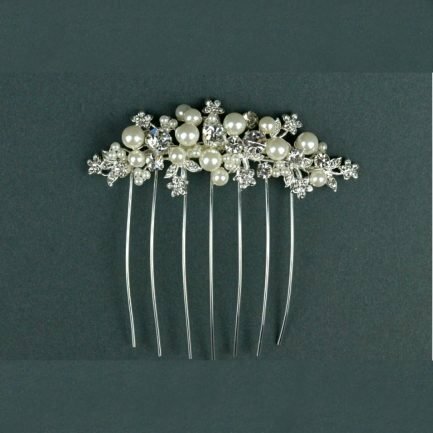 AR554 is a pretty hand wired diamante & pearl bridal hair comb. 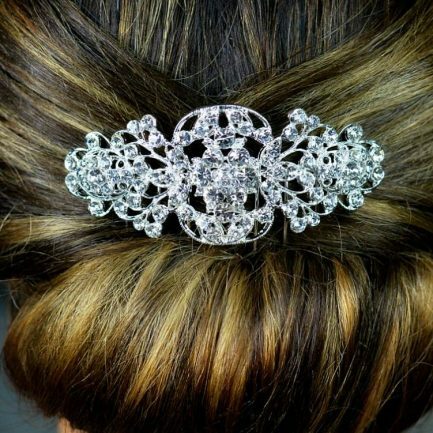 This piece is flexible and can be arranged in the hair. 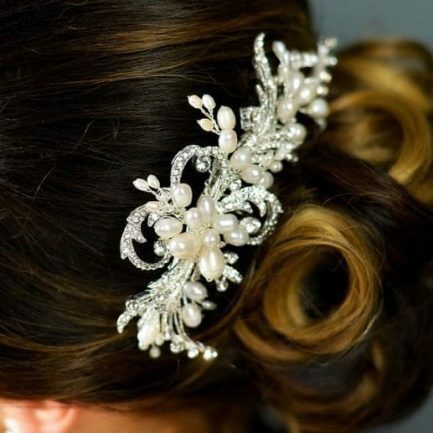 AR552 is a pearl, diamante & crystal bridal hair comb. 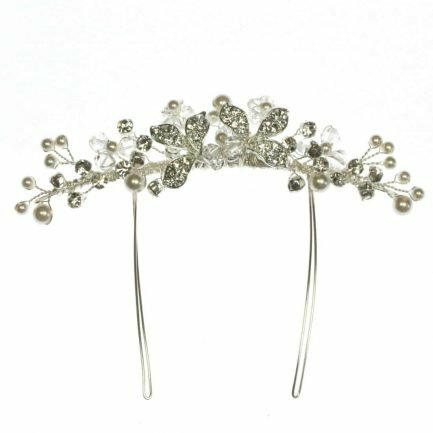 Handmade exclusively in the UK by Arianna Tiaras. 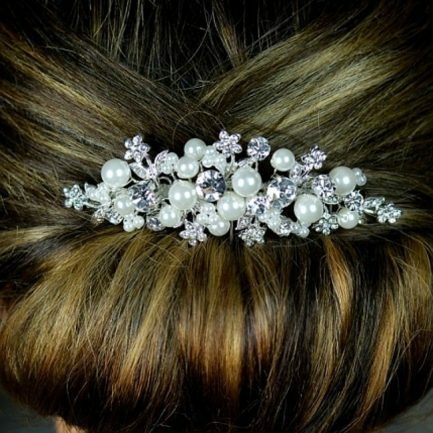 Available in Silver with Ivory Pearls. 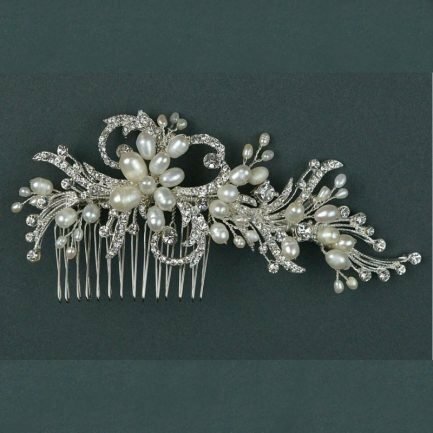 TLH3058 is a freshwater pearl & diamante bridal hair comb. 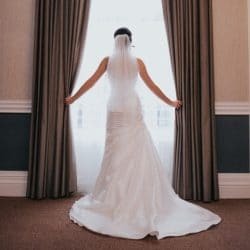 A truly beautiful design. 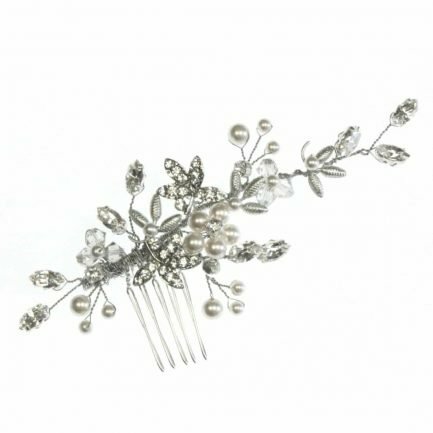 AR559 is a handmade crystal & pearl bridal comb. 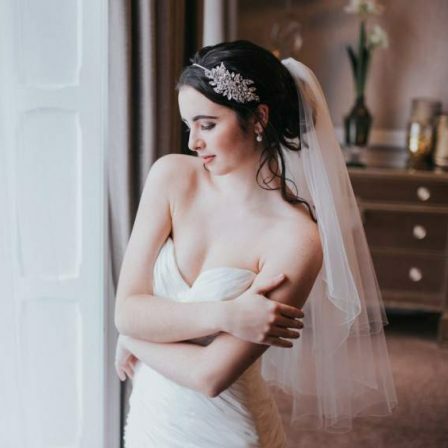 It’s two pronged design makes it an ideal veil toppper as the prongs sit neatly behind your veil comb. 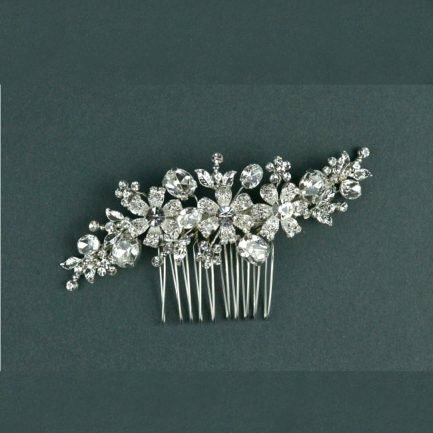 AR550 is a dainty diamante & crystal bridal hair comb. Hand wired, it’s sumpremely flexible to shape to the hair. 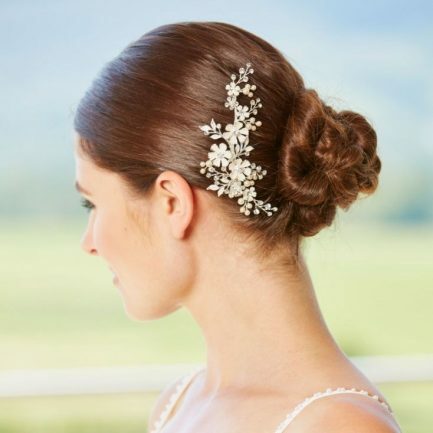 AR580 is a pretty pearl & crystal bridal comb with rectangular baguette cut diamantes. 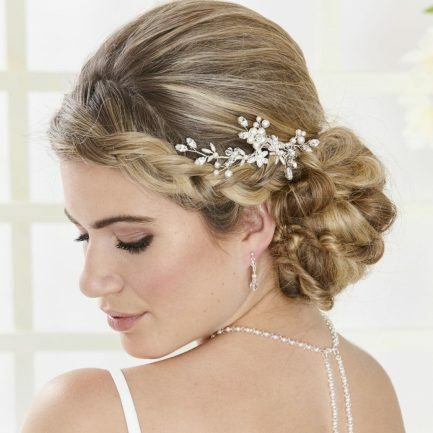 AR578 is a gorgeous crystal, pearl & diamante bridal comb. It can be worn in many different positions. 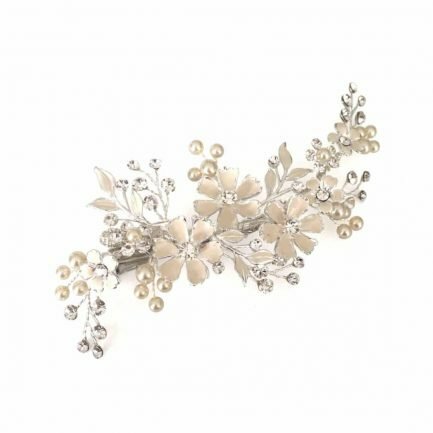 The LP721 bridal hair clip has pretty enamel look flowers, pearls, & diamantes in the design. 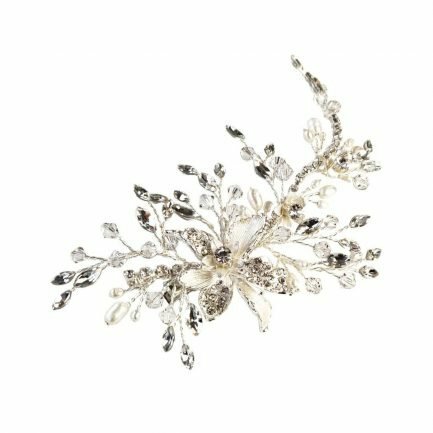 LP720 is a crystal, pearl & diamante bridal hair clip. 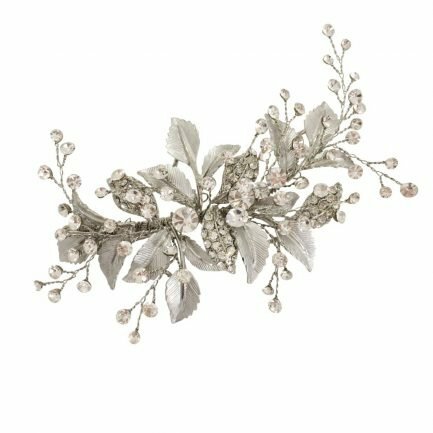 Can be worn in a variety of positions. 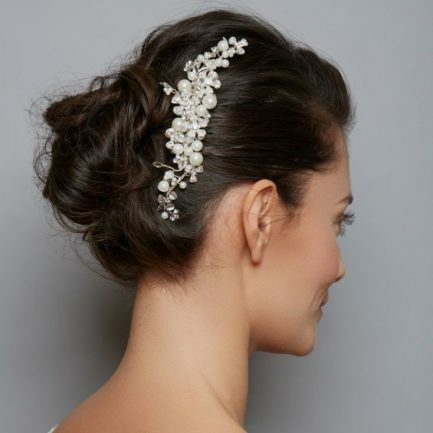 AW1072 is a beautiful pearl & diamante bridal comb. 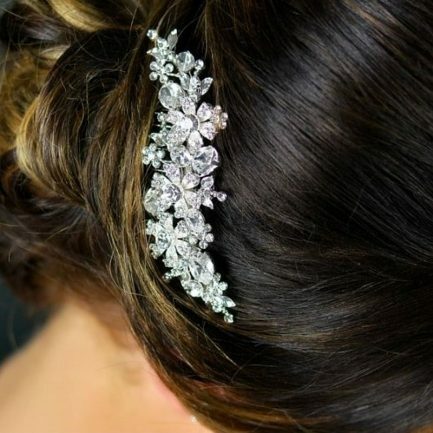 Can be worn in a variety of positions. 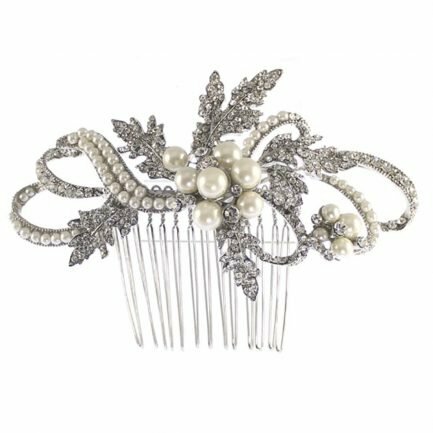 LP704 is a beautiful pearl & diamante leaf vintage style bridal comb. 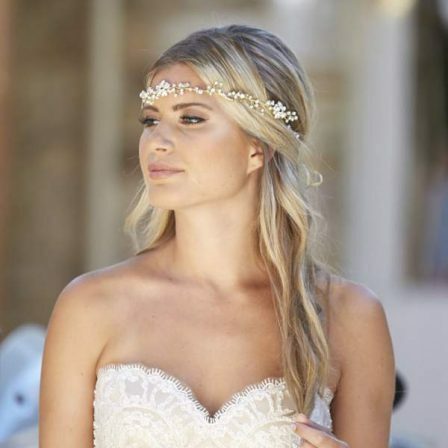 Can be worn in a variety of positions. 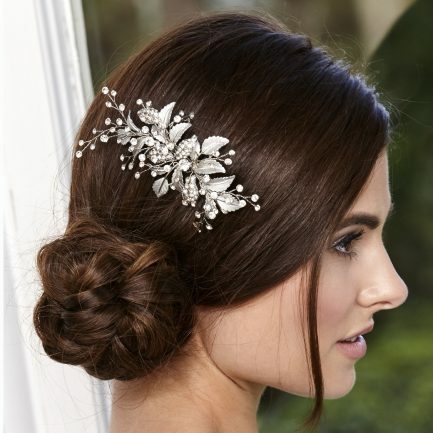 LP671 is a very popular vintage style diamante & pearl bridal comb. 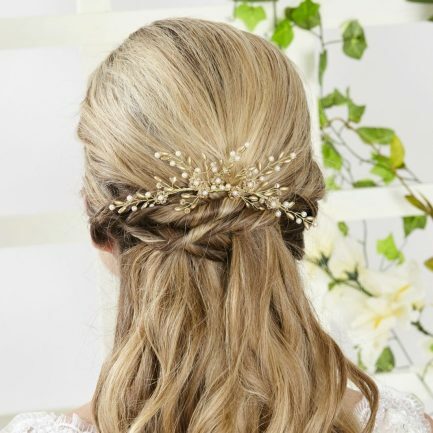 Can be worn in a variety of positions. 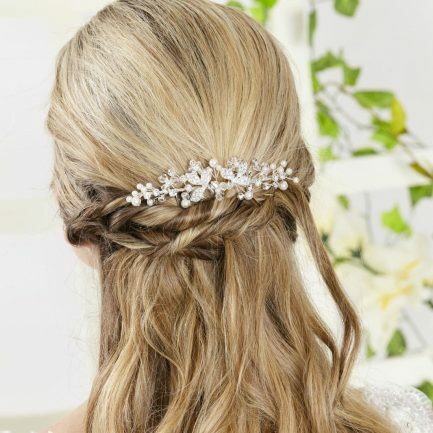 LP675 is a crystal & diamante and pearl hair vine on a small comb. 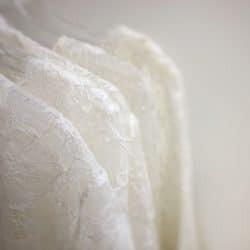 Can be worn in a variety of positions. 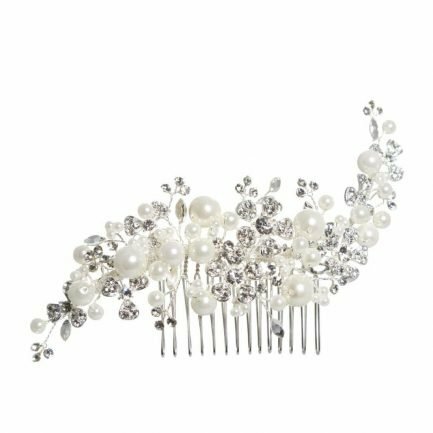 TLH3045 is a diamante & pearl bridal comb. 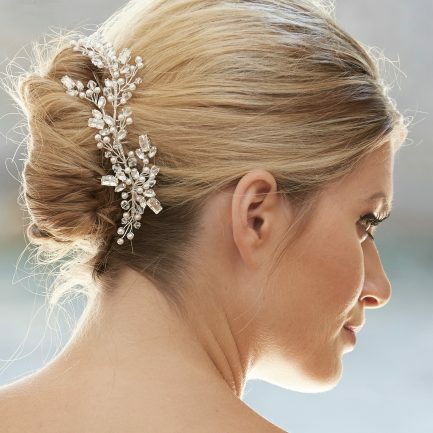 Perfect for wearing above a bun as the prongs are shaped to the head. 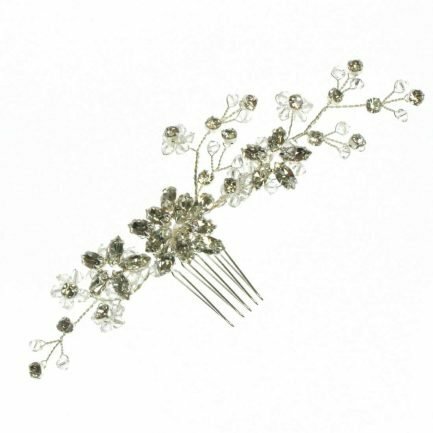 TLH3014 is a diamante bridal hair comb with Swarovski elements. 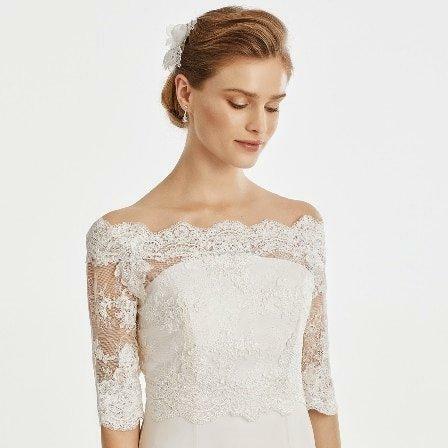 Perfect for a classic bridal look.